Why should you choose this item? Saddle seat design for extra comfort on your back and spine. Our saddle seat made of 100% molded foam,very comfortable, not deformed, elastic,suitable for office, drawing and other places. With advanced technology, the back of the saddle is smooth and round. It has no ugly line compared to some low-end products, which makes the product live longer. Adjustable height: 21.6 "-29.5",higher than ordinary stools, more suitable for a variety of scenarios. At the same time, the wheels adopt the high-grade PU wheels, which are very smooth and will not scratch the floor.Suitable for kitchen, living room,office, clinic, salon,etc. 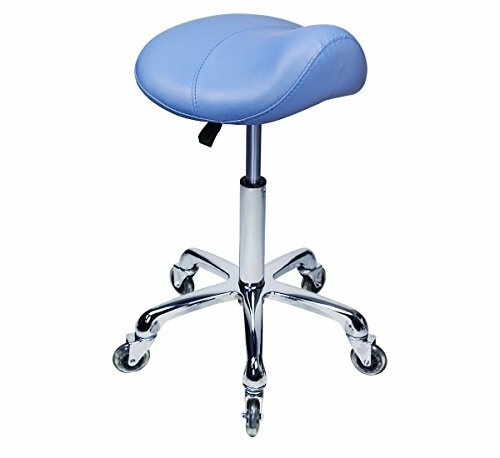 Rotation :The cushions and wheels are free to rotate, you can use this saddle stool to roll freely in the room.Suitable for kitchen, living room,office, clinic, salon,etc. Ergonomic :This swivel stool is designed according to ergonomics, is very comfortable and can sit for a long time.Weight capacity: 350 lbs. No tool assembly required :It takes only 2 steps to assemble this rolling saddle stool chair,less than 2 minutes.Warranty service :1 year. If you have any questions about this product by Antlu, contact us by completing and submitting the form below. If you are looking for a specif part number, please include it with your message.